Did you know that injuries are the leading cause of death among babies? Do your best to prevent them by closely supervising your baby and babyproofing your home. Babyproofing means to make your home as safe and accident-free as possible. Your baby will be mobile in the blink of an eye. In a perfect world, we could watch our babies constantly and prevent accidents before they happen. Of course, this is impossible. Once, my husband and I were standing and talking right next to our toddler son when he decided to explore the bush next to us: we didn’t realize he was going to climb it. He quickly discovered the limb wouldn’t hold him and fell flat on his head. We had thought we were supervising him well, but we looked away briefly and an accident happened. With babies, bumps and bruises are inevitable, but parents must stay vigilant to protect their children from preventable injuries. 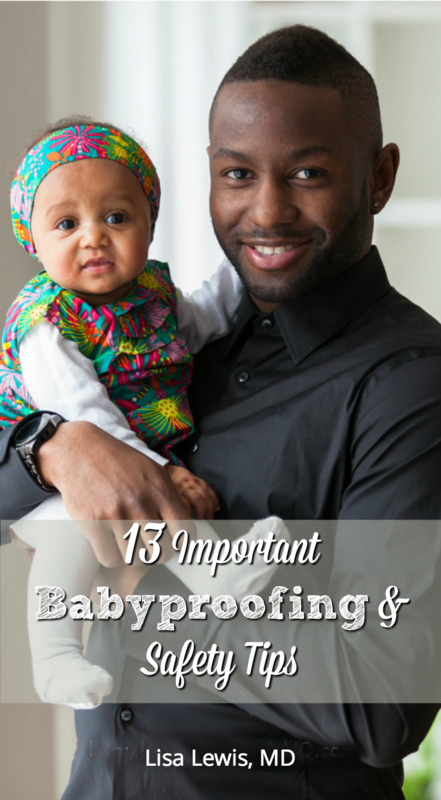 Babyproofing is as important as vaccinating or taking care of a sick child! There are many items available for babyproofing, and every home is different. I’ll cover some of the basics to help prevent injuries in the first year of life. A mobile baby should not be left alone to wander in any room unsupervised. For example, if you take a shower, take the baby into the bathroom with you and shut the door. It is easier to haul your baby with you than to wonder if she is in harm’s way in a different room. If your baby has a play yard that is impossible to penetrate, it is OK to leave the room briefly, but she should not be left for long periods in her play yard without being checked on. She could injure herself with a toy she is playing with or crawl out of the play yard. Be there to prevent accidents. Secure any sources of water. Babies should not have unsupervised access to water. Water heaters should be set to 120°F or less to prevent major burns. Toilet lids should be shut and locked while not in use. Faucets that are within your baby’s reach require protectors so he can’t turn them off. Any swimming pool should feature a locked, four-sided, gate so that your child cannot have access to the water. The gate should have a self-latching feature. When you are swimming, your baby should wear a life vest at all times. Don’t take your eyes off of him. If you need to leave or disengage, assign a responsible adult to watch him. Never leave your baby or older child in the bathtub unattended: babies and toddlers can drown in very shallow water. Ensure he has no exposure to excess heat. Never cook and leave her alone in the kitchen. Kitchen guards should be on the kitchen stove, so she can’t pull a pot of hot food or water down on herself. Use cabinet and door latches to secure all cabinets and doors. Can it be harmful if she ingests something? Not sure? Lock it away or get rid of it. Remove all cords and use outlet covers. Cords can cause strangulation or electrocution and should not be present where a baby can reach them from the counter or a table. Most blinds now are made without cords, but cords on older mini-blinds should be clipped and out of the baby’s reach. Outlet covers prevent electrocution and should be placed in all visible outlets. Or place a large piece of furniture in front of the outlet, as many toddlers can remove outlet covers. Secure all windows and stairs. Do not use the gates that pop into the wall; a little pressure pops them right out. Safety gates at the top of stairs should be anchored to the wall. Remove objects he can choke on or that he can pull on himself and get hurt. Walk around your home. Are there any objects a baby or toddler can reach and choke on such as coins, batteries or small plastic toys? If so, move them to a place he can’t get them. Are there any large objects, such as an unsecured piece of furniture, that he can pull down onto himself? Furniture that may fall on a baby if he pulls up on it should be removed or secured to the wall. Smoke and carbon monoxide detectors should be placed near each room your family sleeps in, in the family gathering area (den or living room), and on every floor of your home. Do not rely on the devices to beep if they aren’t working properly: test them once a month to ensure that they work. Lock away all cleaning agents, medicines, and any other toxic substances. Use cabinet and door latches to secure all cabinets and doors. Will ingesting something in particular be harmful? Not sure? Lock it away or get rid of it. Throw away old prescription medicines, and go through and get rid of any cleaning agents or toxic substances you do not need to keep. Medications in your car or purse should have a safety-proofed lid. Keep the poison control number handy. If your baby ingests anything potentially toxic, call The Poison Help Line immediately at 1-800-222-1222. Babies can look normal after a poisoning but get very sick later. Don’t be embarrassed to call the number and give information: a The Poison Help Line’s goal is to save lives and protect people from serious illness, not to judge you. Ask family members to learn it, too. You can check with your local hospital or doctor to find nearby places to learn CPR. Some employers offer CPR courses in the workplace. Have an emergency exit plan for each room. Go over the plan with adults, and keep a copy of it in your child medical kit and on the refrigerator for reference. Adults and older children should know how to get out of windows in their rooms. For two-story homes, consider purchasing drop ladders for the windows that fit under each bed. It’s worth the investment to have peace of mind that you can easily escape if trapped upstairs. What if someone else is caring for your baby? Make sure your emergency numbers are readily available. Show the caretaker where the child medical kit and The Poison Help Line phone number are located. Clearly state your expectations for care. Don’t be afraid to make lists to ensure the caregiver is taking safety precautions.